This article is about the young and very talented cricketer virat kohli. A very dashing batsman and middle order batsman he was the captain of the U-19 world cup winning team. Here is given the profile, cricket career and cricket records of this great player. Virat Kohli is the Future of Indian Cricket. Having born on 5 November, 1988 in Delhi, this cricketer shows skills of a very good batsman. Making his First Class debut in year 2006, he contribute well to his Delhi Team. He soon become the Captain of Indian Under 19 Cricket Team for U-19 Cricket World Cup 2008. Under his captaincy, the team won the world cup. He himself plays some good innings including an aggressive century against West Indies U-19 Team. With excellent start of his career in First Class Cricket and in Under 19s Team, kohli was called in the Indiam ODI Team in the absence of Sachin and Sehwag on the tour of Sri Lanka in 2008. He performed well in the five match series but immediately dropped from the team because of the return of the senior players. He make his comeback in the ICC Champions Trophy 2009. He made impact by hitting couple of centuries and match winning innings. His good form makes him the fastest Indian to complete 1000 runs in ODI Cricket. Later he also become the fastest Indian to complete 2000 runs. 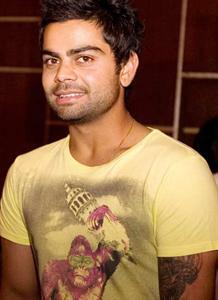 Virat Kohli secured his place in Indian ODI Team for the 2011 Cricket World Cup. In his debut World Cup Match, Kohli hit a brilliant century in the opening match of the tournament. His contribution in the Final against the Sri Lanka was also very important, where India defeated the Sri Lankan Team and become The World Champion. Due to absence of so many senior players, Kohli was selected for the West Indies Tour in the Test Team and he played in all the three matches, but fails to perform well. Virat Kohli is one of the most talented young player in the World. And, we are sure that he will fill the place of Senior players like Sachin, Dravid and Laxman in the Future.